The Microsoft co-founder invested $50 million in the Dementia Discovery Fund. Bill Gates wants to help find a cure for Alzheimer's disease. To do that, the Microsoft co-founder invested $50 million in the Dementia Discovery Fund. "We basically don't have a treatment for it," Gates said in a video post. "But I'm hopeful. We have much better tools. We have more scientists. We need a lot of ideas here to give us the highest chance that will lead to an Alzheimer's cure." Alzheimer's is the most common type of dementia. The Alzheimer's Association says more than 5 million Americans are living with the progressive disease, which impairs memory and cognitive function. While there are currently treatments available for certain symptoms of Alzheimer's, there's no overall cure for the disease. CNN notes this is the first-known time Gates has donated money toward research into a noncommunicable disease. 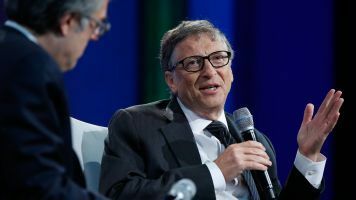 Gates made this $50 million investment himself — not through the Bill and Melinda Gates Foundation, which has focused more on infectious diseases like malaria and HIV.